Developing lifelong learners through literacy; for every student,; for every student, every school,; for every student, every school, every community. Magnet programs create exciting learning opportunities that promote student achievement. They are programs that have a special focus, ranging from science and world languages to performing arts and computer programming. They provide in-depth experiences and distinct choices for students with different interests, talents and aptitudes. 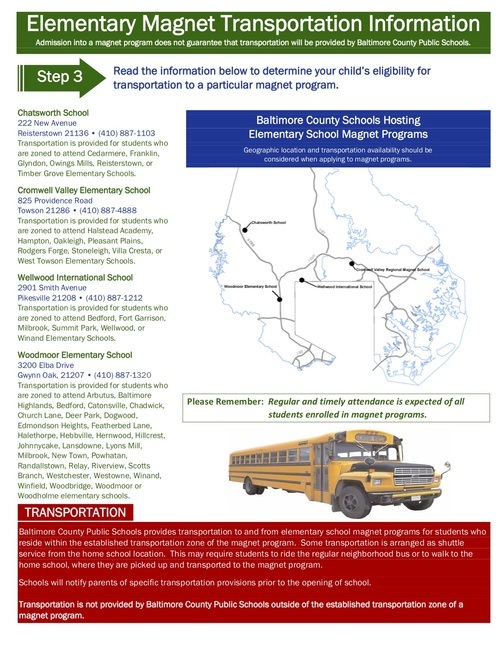 Call or visit the Magnet Program in which you are interested, visit the Office of Magnet Programs’ Web site (www.bcps.org/offices/omp), or call the office at 443-809-4127. Contact Us .